After dribbling towards the top of Bayer Leverkusen’s 18-yard box, Christian Pulisic hit a pass to the opposite side of the penalty area. The ball reached his fellow winger in open space thanks to a slip by the opposing full back, and, after one smooth, controlling touch with the left foot, Jadon Sancho curled a shot with his right foot around the keeper and into the inner side of the net to become the youngest English player ever to score in the German top flight. 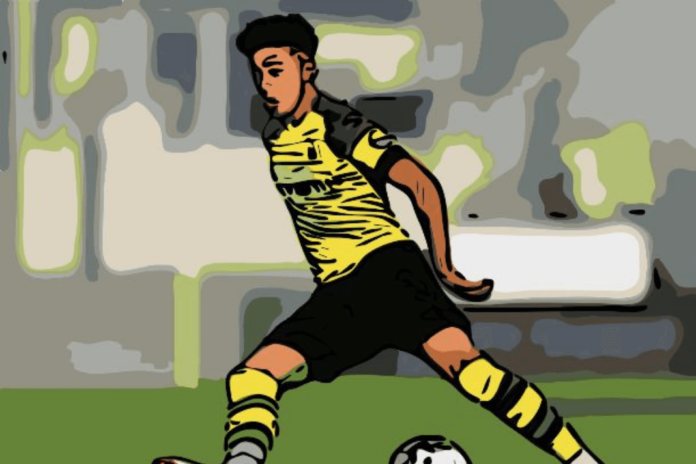 Since his first goal, Jadon Sancho has lit up the Bundesliga with his flashy, energy-filled style of play. This season, the wide man leads the league in assists despite only starting five matches, and leads his club, Borussia Dortmund, in key passes per 90 minutes. He recently scored his first Champions League goal a mere four minutes into his substitution against the famously-stout Atlético Madrid. So just how has this 18-year-old suddenly become a significant playmaker for his side? The answer begins back at his home in the south of London. His story has an aura similar to France’s prodigious star Kylian Mbappé; a kid, growing up in a dangerous area of the biggest city in the country, who fell in love with the ball at his feet. Born to parents from the South American island nation of Trinidad and Tobago, a young Jadon Sancho began playing football at an early age. Though it didn’t start at a major club or academy; it started when he was playing on the streets of Camberwell, a district of South London. Sancho’s U-15/U-16 coach Dan Micciche, in an interview with The Guardian, puts it bluntly. “Jadon did a lot of his learning on the street through informal play. People think academies produce these players- they don’t. They do a lot of things: they support, develop, nurture. But they inherit 90%, 95% of the player, even when they join at nine. It’s about the other five, 10% that can be crucial, as the player is either completed or the 90 shattered”. This street football style of player is something scouts would expect to find in the favelas of Rio de Janeiro; it’s not a common mould coached out of the boroughs of London. After eventually joining Watford’s academy, Sancho moved to Manchester City. Playing at one of the most elite academies in the country, he soon found ample playing time hard to come by. So in 2017, after reaching the Final of the European U-17 Championship (not to mention winning the Golden Player Award of the tournament) but before winning the U-17 World Cup, Sancho made a rare, extraordinary decision to move to a football club 428 miles away, in North Rhine-Westphalia, Germany. The last couple seasons for Borussia Dortmund have been inconsistent if not concerning. After defeating Eintracht Frankfurt in the 2016-17 DFB-Pokal Final, the club placed fourth in the Bundesliga in 2017-18 after winning only one of their final five league matches and failed to advance out of a tough Champions League group that included Real Madrid and Tottenham Hotspur. 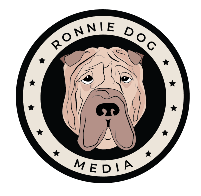 Fast forward to today and Dortmund has just recently defeated rivals Bayern Munich, is undefeated in the league this season with a four-point lead at the top of the table, and is tied at the top of their Champions League group. While this flying start has been a collective effort, Sancho has been a crucial cog in the club’s run. 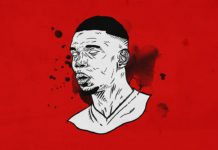 In order to understand the keys to Sancho’s early-season success, one first must understand the sound, sturdy tactics in manager Lucien Favre’s system. If only one word was allowed to describe Favre’s system, it would be structured. 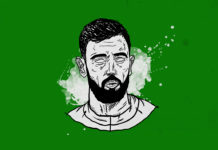 He utilizes possessive, positional tactics, building possession up from the back patiently beginning with the centre backs and letting space open up ahead for full backs, deep midfielders, or wingers to run or pass into. The method of cycling the ball around the back is often used in Favre’s Dortmund side when in possession. This can be an effective way of opening up space in certain areas. In the picture above, the right centre back, Manuel Akanji, passes the ball to Axel Witsel, the central defensive midfielder, who has dropped back between the centre backs to assist in the cycle of possession. This tactic, which is commonly used in 4-3-3 formations, has also pulled Witsel’s opponent back with him. Witsel passes the ball to the left centre back, Abdou Diallo. 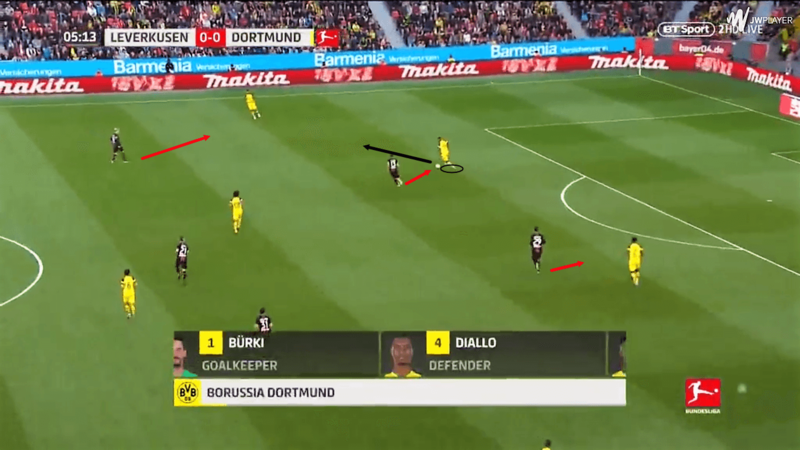 Left central midfielder Thomas Delaney has also pulled in centrally into the space Witsel was occupying, therefore bringing his marking opponent in with him. This has given the left back space to receive a pass from Diallo. 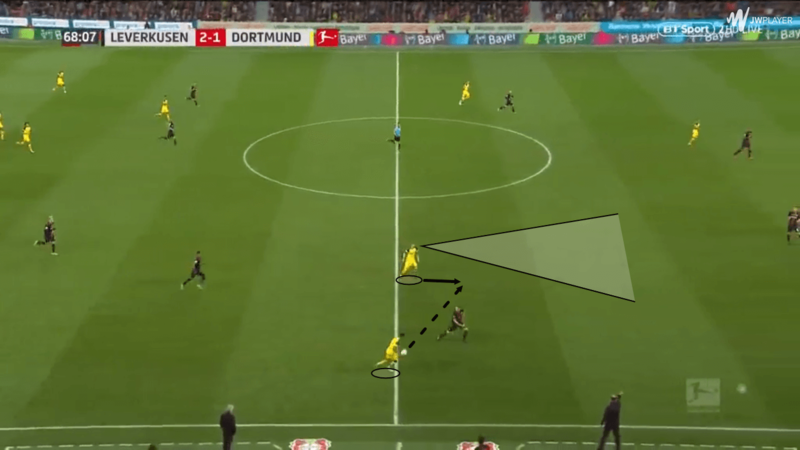 By letting the opponent focus on the ball, Dortmund allows space to open up to progress the ball. There is a sense of patience when the opposition doesn’t press, as the defenders take their time to scan the pitch in front of them before either cycling the ball around or attempting a pass forward. Yet when the opponent does press, Favre’s tactic remains the same. This sequence shows how cycling the ball is used against the press. Bayer Leverkusen’s forward players enact a press, so Akanji dribbles forward to draw defenders. This action freezes a pressing player between Akanji, right back Achraf Hakimi, and Pulisic. This pause by the opponent gives the centre back space and time to pass the ball forward to the American. Even after the opponent’s team press succeeds in forcing the ball backwards here, the press has now opened up space centrally in which Akanji, who has had the ball returned to him, passes to Delaney, who is in open space in the left half-space. Some may consider this conservative possession style as “safe”, but sometimes safe is the solution. The plan that manager Didier Deschamps installed for France at the World Cup is a case in point; he mostly deployed a very controlled, organized 4-2-3-1, including utilizing the defensive-minded Blaise Matuidi as the wide left midfielder. This move was criticized, but it became an important part in Les Bleus lifting their second World Cup trophy. 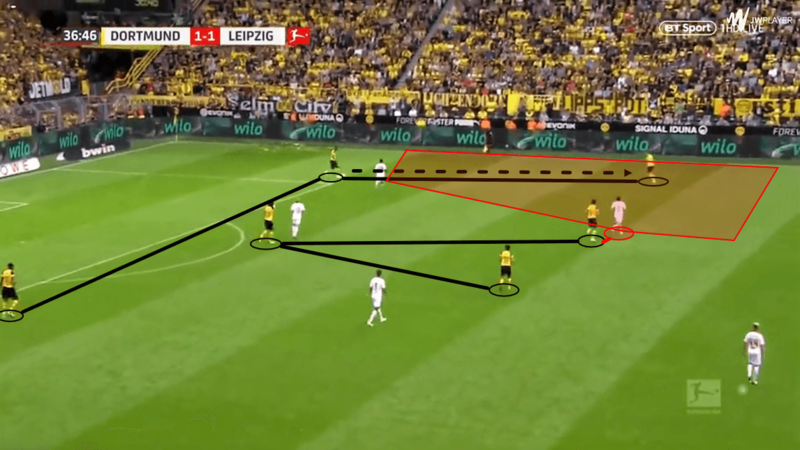 Knowing how the possession cycling works in Favre’s structure is important because it shows how Dortmund can open up space for Jadon Sancho going forward. When the ball is cycled to the opposite side of the pitch, this can open up large areas of space. Right back Łukasz Piszczek receives the ball and sees his forwards in large swathes of space. Substitute striker Paco Alcácer falls back into the right half-space to receive a pass as Sancho moves into the wider areas. After receiving the pass, Alcácer immediately plays Sancho a through pass, where Sancho is now one-on-one with his opponent in space. 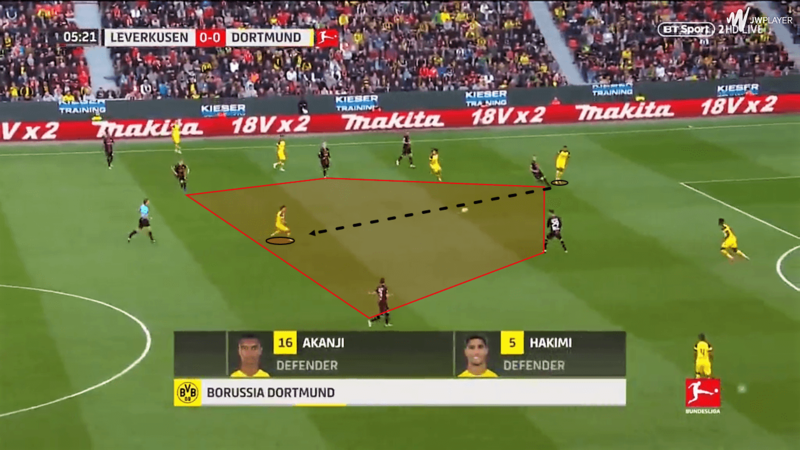 The movement of the ball, the switch of play, and the creation of overloads and one-on-ones have all been instrumental in opening up space ahead for Dortmund’s attackers. With quality wingers like Marco Reus, Christian Pulisic, and more recently, Jacob Bruun Larsen, Marius Wolf, and Sancho, this tactic has been extremely successful. It has even led to the Swiss manager positioning Reus centrally, similar to the way Raheem Sterling at Manchester City and Neymar at Paris Saint-Germain have been positioned at times this season. This, of course, isn’t to say Jadon Sancho’s success is entirely accredited to Lucien Favre. The urban street-baller-turned-Bundesliga winger has been fruitful in this system due to his skilled ability on the ball and his discipline on the pitch. This picture shows the rigid structure of Favre’s 4-2-3-1 and the self-control by Sancho to stay wide on the far side, maintaining his width, and consequently maintaining major areas of space that the defenders have to mark. This specific attack eventually ends with a goal by Sancho. 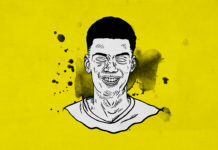 While the tactics have matched well with Jadon Sancho, the Englishman has grown popular among football fans for his creativity and ball control. His close-footed dribbling is extremely impressive in tight spaces, akin to Neymar or Manchester City’s Bernardo Silva, and he is very intelligent when passing the ball in the final third. In this sequence, Sancho passes the ball ahead of Reus into space. Sancho then cuts inside between the opposing left back and center back, and Reus returns the pass. 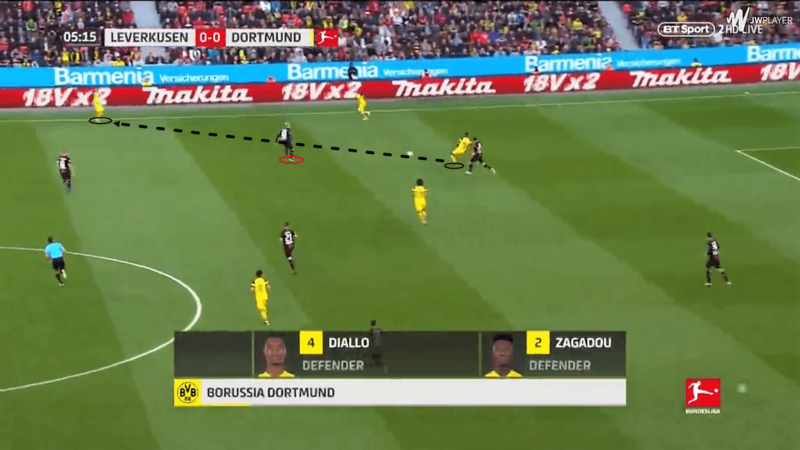 After seeing that the two defenders running alongside himself and Reus have both been drawn towards him after his run into the box, Sancho makes an accurate pass back to Reus, who is open in the middle of the box for a quality shot, resulting in a goal. Through dedicated coaching of the system, however, Sancho has found even more ways to create for his teammates. After Sancho has broken away down the right side using his pace, he makes a decision to dribble into the box, then make a creative, anticipative move. Sancho shows his control as he pulls the ball back on the counter-attack, shaking two defenders in the process. 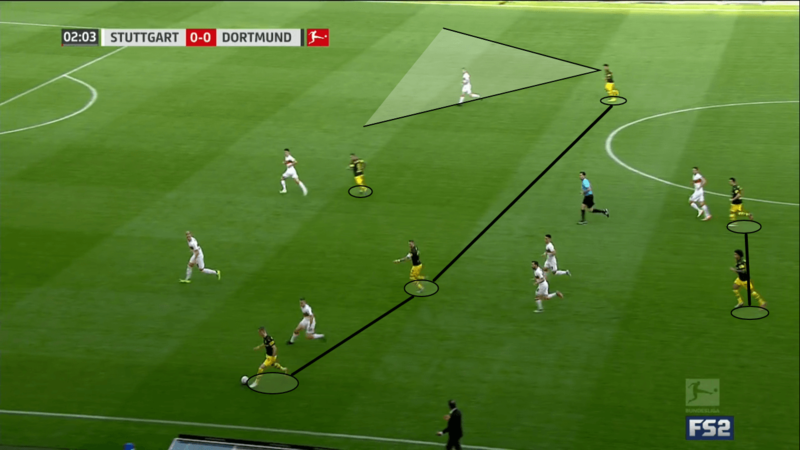 Favre’s system has taught the players to look to the opposite side of the pitch for open space, and Sancho uses his vision to exploit said space behind the defenders. The cross meets the feet of Wolf, who scores. These skilled abilities all harken back to his childhood. The style of dribbling has come from his days playing in the small alleys of London. The tough neighbourhood he grew up in has gifted him a very strong mentality. An ego, but not one that will sacrifice the team’s goals for his own. Some will consider it a smart decision to step away from the bright blue moon of Manchester City in an attempt to find playing time. Others will say it was only a matter of time before his skills broke through Pep Guardiola’s ranks. Jadon Sancho has fit brilliantly in Lucien Favre’s system at Borussia Dortmund. His dribbling, energy, vision, and finishing skills at such an early age point to a promising future as a footballer. Yet it still feels more intricate than that. He has an uncharacteristic English flair, a penchant for creating the unexpected, and a distinguished chip on his shoulder. The move beyond the shores of the United Kingdom was a brave one, and it has begun to pay off in spades. Multiple English youth players have traded the comforts of home for a spot on a German club; it would not be surprising if it came out that fellow Three Lions winger Reiss Nelson’s move, now on loan at Hoffenheim from Arsenal, was influenced by Sancho’s willingness to challenge the norm. As England have had a strong start to the new FIFA four-year cycle, manager Gareth Southgate would be remiss if he failed to include Jadon Sancho in the national team’s long-term future.